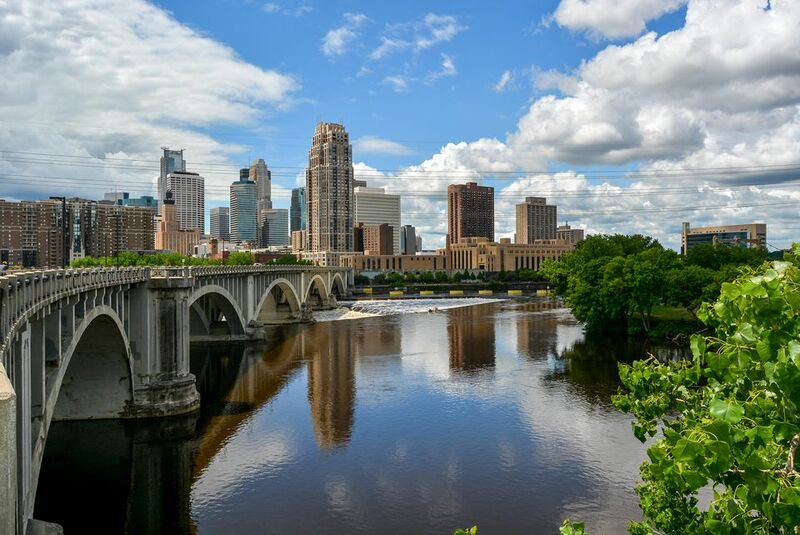 If you're looking for trendy shops, nightlife, and outdoor recreation, add Minneapolis' Uptown neighborhood to your must-see list during your visit to the Twin Cities. About a mile south of downtown Minneapolis, Uptown is where fashionable residents live, work, and play. Here you'll find a high concentration of stylish homes, stores, bars, and restaurants. The neighborhood borders beautiful Lake Calhoun, used by runners, cyclists, and fit people in general. Uptown isn't an official neighborhood of Minneapolis, rather it's the name used for the fashionable part of town centered around the intersection of Hennepin Avenue and Lake Street. The borders of Uptown are not defined but are usually agreed to be Lake Calhoun to the west and Dupont Avenue to the east. The north and south borders are debatable, but Uptown proper is usually between 31st Avenue to the south and somewhere around 26th Street to the north. Uptown can also refer to a much larger area. Many people would also include several additional blocks to the south, east, and north. The lakes of Uptown Minneapolis have been popular for recreation since the 1880s. Uptown as a residential area was originally developed in the early 20th century. Large lakefront houses and apartments were built for commuters using the new streetcar system. In 1928, the Lagoon Theater, now the Uptown Theater, opened on the corner of Hennepin and Lagoon avenues. The area soon became a busy commercial district and survived a 1938 fire that destroyed the original Lagoon Theater, economic downturns, crime, and neighborhood decay to become once again one of Minneapolis' most fashionable areas. Apartments are plentiful in Uptown Minneapolis with stylish mid-sized 1920s buildings, stylish modern buildings, and cheaper, less stylish mid-century and 1970s buildings. Single-family homes, usually larger homes, were built in the early and mid-twentieth century. Apartment rents are reasonable because of the large supply, but buying a house in Uptown is more expensive than the average home price in the city of Minneapolis. Uptown Minneapolis is viewed as home to mostly young professionals and college students drawn to its nightlife and fashionable shops. There are certainly plenty of hipsters here, but couples and older professionals like Uptown, too, for its proximity to the lakes, walkability, and attractive housing. Families also live here for amenities such as the Uptown library, local schools, and the lakes and parkland. Uptown Minneapolis' nightlife is centered on the intersection of Hennepin Avenue and Lake Street. Bars such as Chino Latino and the Uptown Bar attract all the beautiful people, and restaurants such as Barbette, Chiang Mai Thai, and Namaste Cafe offer American and international cuisine. Hipsters who shop at chain stores will find two staples in Uptown: American Apparel and Urban Outfitters. The Hennepin–Lake intersection also has stylish homeware stores, fashion and beauty shops, and spas. On Lake Street, upmarket food retailer Lund's has a supermarket. Minneapolis' lakes have been used for recreation for more than a century. Uptown's Lake Calhoun is where visitors go for a stroll after dinner and where residents go for their daily 6 am jog. Lake Calhoun also has two beaches, and the parkland around the lake is a favorite of sunbathers. In the summer, Lake Calhoun is popular for windsurfing and kayaking. In the winter, snow-kiters use parachutes to snowboard across the lake. Many families live in the Uptown neighborhood. Just a few streets from the commercial district, the streets get much quieter and many professional families live in the larger homes in the neighborhood. Playing at the beach and by the lake is a popular pastime for local kids, as is the family-friendly Uptown Library, with the giant silver letters outside. There is no school here, but Jefferson, Whitter, and Lyndale school are nearby. The popularity of Uptown, the commercial district, the high population density and the traffic bottleneck caused by the lakes means that traffic in the area can be bad. Parking can be a headache for nonresidents because many streets are reserved for Uptown residents' cars, and much of the rest of the streets are metered parking. Once you get out of Uptown, the Twin Cities' major freeways, I-35W and I-94, are close. In the summer, biking is the preferred transportation mode for many Uptown residents. The Midtown Greenway runs from Seward through Midtown to Uptown and then connects with several other bike paths and trails.